(2012.088.16, Lewis A. Danner Collection, OHS). Named for the Comanche tribe, Comanche County lies within the Wichita Mountains region and the Red Bed Plains. The county is drained by the West Cache, Cache, and Beaver creeks. Originally part of the Kiowa-Comanche-Apache Reservation, the area was opened to non-Indian settlement by lottery on August 6, 1901. 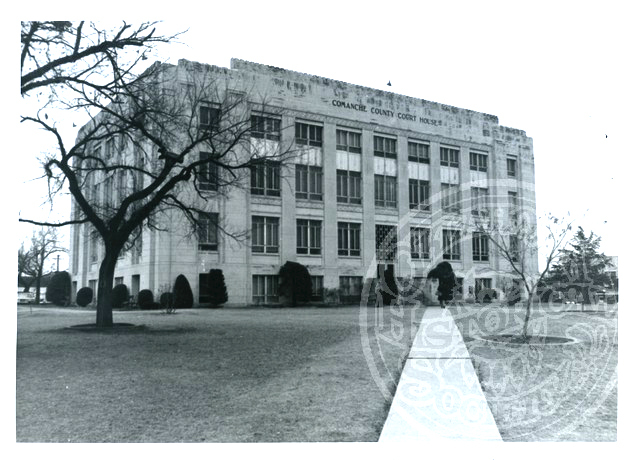 The county and the county seat of Lawton were created on that day. In December 1906 the south-central part of Comanche County known as the Big Pasture was opened for settlement by sealed bids. Located in southwestern Oklahoma, Comanche County is bordered on the north by Kiowa and Caddo counties, on the east by Grady and Stephens counties, on the south by Cotton and Tillman counties, and on the west by Tillman and Kiowa counties. In the early twentieth century Comanche County's boundary lines changed, and its land area was reduced by more than half. At 1907 statehood parts of the county were taken to create Tillman County and to add to the areas of Grady, Jefferson, and Stephens counties. In 1910 the western part of Comanche County and southern part of Kiowa County formed the short-lived Swanson County. In 1912 Cotton County was created from the southern portion of Comanche. After that time the land and water area totaled 1,083.82 square miles. The majority of archaeological sites in Comanche County date to the Archaic and Plains Village period. Two sites near Lawton are representative of these periods. Archaeological evidence such as a burial, artifacts, and rock-lined hearths near present Lawton suggests human occupation during the Archaic period. This site, known as the Gore Pit District, is listed in the National Register of Historic Places (NR 80004520). At Fort Sill an excavated site known as the Pig Farm Crossing indicates the existence of a village during the Plains Village period. In the seventeenth century Spaniards came to the area to spread Christianity among the American Indians and to search for gold. In 1629, as part of a Spanish expedition sent from Santa Fe (New Mexico), Father Juan de Salas came to the Wichita Mountains and established a short-lived mission. In 1650 Don Diego del Castillo commanded an expedition to locate gold and silver in the same mountains. Legends of buried treasure led to a gold-seeking frenzy in the Wichitas from the 1890s to the early 1900s. Miners established the town of Meers, which had a smelter and a peak population of five hundred before its demise in 1905, following the mining bust. In 1803 the United States acquired from France the area known as the Louisiana Purchase, which included present Oklahoma. During the early 1800s the Five Tribes were relocated from the southeastern part of the United States to Indian Territory (I.T.). Among these tribes were the Choctaw and Chickasaw, who were situated in the southern portion of I.T. In 1855 the federal government leased the western portion of their lands, known as the Leased District. This area was located in southwestern part of present Oklahoma. Through the Reconstruction Treaties of 1866 the Choctaw and Chickasaw ceded the Leased District to the federal government. As part of the Medicine Lodge treaties of 1867 the Kiowa, Comanche, and Apache were assigned a reservation in the district, which included present Comanche County. About the time of the removal of the Five Tribes two events occurred in this area. In 1833 an Osage hunting party raided a Kiowa village in the Wichita Mountains at a place later known as Cutthroat Gap, near present Cooperton in Kiowa County. In 1834 the Dodge-Leavenworth Expedition left Fort Gibson, traveling to a Wichita village in present western Oklahoma. Dodge negotiated with the Kiowa, Comanche, and Wichita, requesting that they refrain from attacking whites and the Five Tribes. After the Civil War, in January 1869 Gen. Philip Sheridan established Fort Sill (originally known as Camp Wichita). The Old Agency Village, also known as the Red Store, was situated near the fort. Primarily serving as the Comanche subagency, the village had three general stores, a blacksmith shop, a church that also served as a school, and a few homes. The settlement existed until Lawton was created on August 6, 1901. In 1896 the Mennonite Brethren established Post Oak Mission near present Indiahoma, situated west of Lawton. After lands were allotted to the Kiowa, Comanche, and Apache and the Big Pasture was set aside, the area was opened to non-Indian settlers in 1901. Previous land openings in Oklahoma Territory had been accomplished by runs that resulted in human injuries and land claim disputes. Consequently, a lottery was determined to be a more orderly method. When the lottery occurred on August 6, 1901, some lottery winners established homesteads, and others bought town lots in Lawton. Other incorporated towns that developed following the lottery included Cache, Chattanooga, Elgin, Faxon, Fletcher, Geronimo, Indiahoma, and Sterling. Medicine Park was not established until 1908. Comanche County's economy has been based largely on agriculture, livestock raising, and the military presence at Fort Sill. Principal crops have included cotton, wheat, corn, oats, hay, Kaffir corn, and broomcorn. As reported in 1908, 300,000 acres were under cultivation. In 1930 the county had 2,913 farms consisting of 568,241 acres. Those farms were operated by 1,790 tenants, 1,100 owners, and 23 managers. In 1956 there were 1,477 farms and ranches, totaling 482,331 acres. By the turn of the twenty-first century the number of farms had declined to 1,030, and farmland had dwindled to 434,526 acres. Mineral resources such as oil and gas, granite, limestone, and gypsum have also contributed to the economy. Oil and gas wells were developed near Chattanooga, Elgin, Fletcher, and Sterling in the early 1900s. By the mid-1950s Comanche County had a diversified economy that included seventeen food-processing plants, eight stone quarries, five wood products plants, and two garment factories. At that time revenue from stone, petroleum, and natural gas production annually totaled $2.5 million. Retail trade and health care were the leading industries at the turn of the twenty-first century. Comanche County's first educational facilities provided schooling to American Indians. In 1871 Rev. Josiah Butler, a Quaker, founded Josiah Missionary School, which later became known as Fort Sill Indian School. Initially, the facility provided education to the Apache, Comanche, and Kiowa. In 1958 it continued as a boarding school for American Indians, with 41 faculty and 230 students. Following the 1901 land lottery settlers established subscription schools until tax revenue could be generated to support public schools. Higher education was offered in 1908 when the state legislature approved the opening of the Cameron State School of Agriculture (now Cameron University) in Lawton. At the turn of the twenty-first century the Great Plains Technology Center in Lawton provided vocational-technical education. In addition to the waterways and American Indian trails, early transportation routes followed the military roads that connected Fort Sill to Camp Supply, Fort Towson, and Fort Smith. In the early twentieth century the Oklahoma City and Western Railroad (later the St. Louis and San Francisco Railway) and the Enid and Anadarko Railway (later the Chicago, Rock Island and Pacific Railway) linked the towns supported by the agricultural region with outside markets. By the 1930s six bus lines operated in Lawton. Into the twenty-first century Interstate 44, U.S. Highways 62 and 277/281, and State Highways 7, 17, 36, 49, 58, and 65 served the county. At 1907 statehood Comanche County's population stood at 31,738. It fluctuated from 41,489 in 1910 to 26,629 in 1920 and 34,317 in 1930. From 1940 to 1980 the population continued to climb, reaching 112,456 in 1980. Declining to 111,486 in 1990, it rose to 114,996 in 2000. In 2010 the census reported 124,098 residents, of whom 81.3 percent were white, 8.9 percent American Indian, 2.1 percent African American, and 0.2 percent Asian. Hispanic ethnicity was identified as 11.2 percent. Among the prominent Oklahomans who have lived in Comanche County are U.S. Sen. Thomas P. Gore, U.S. Reps. Scott Ferris, Lorraine Michael "Nick" Gensman, and Toby Morris, and U.S. Rep. and Sen. John William Elmer Thomas. Rosemary Hogan, World War II nurse, also hailed from Comanche County. Local recreational amenities included Lakes Lawtonka and Ellsworth, Elmer Thomas Lake, the Wichita Mountains National Wildlife Refuge, and the Museum of the Great Plains in Lawton. During the first half of the twentieth century outdoor activities were enjoyed at Craterville Park and Medicine Park. On December 19, 1960, Fort Sill was listed as one of Oklahoma's National Historic Landmarks. "Comanche County," Vertical File, Oklahoma Room, Oklahoma Department of Libraries, Oklahoma City. "Comanche County," Vertical File, Research Division, Oklahoma Historical Society, Oklahoma City. The History of Comanche County, Oklahoma (N.p. : Southwest Oklahoma Genealogical Society, 1985). Linda D. Wilson, "Comanche County," The Encyclopedia of Oklahoma History and Culture, https://www.okhistory.org/publications/enc/entry.php?entry=CO035.